*There was no Vol. 2, at least so far as I know. *This book was available only in Toys “R” Us stores. It also came with a set of 4 TMNT trading cards from Fleer. Hey, here’s one of those things I forgot I even owned. Digging through my long boxes for some peculiar odds and ends, this little promotional comic (that cost $2 at retail) popped up with the other miscellaneous publications. 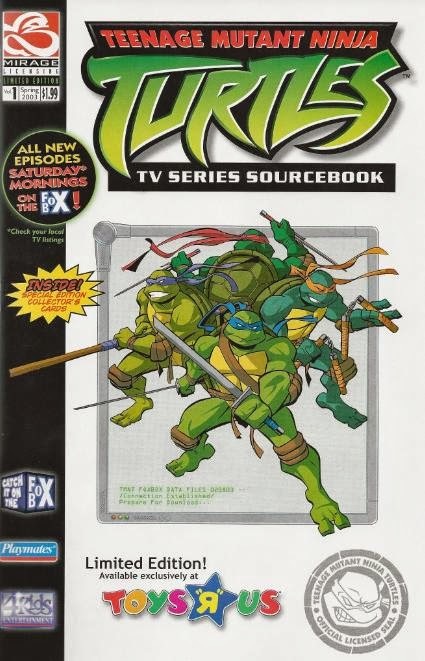 Based on the 4Kids TMNT cartoon from 2003, this sourcebook is a neat little thing and I do wish they had made more of them (DID they make more of them? I can’t find any info). 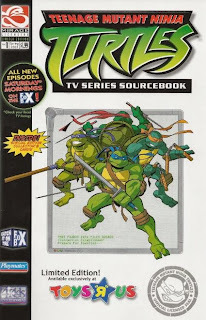 It isn’t nearly as meaty as Archie’s TMNT Mutant Universe Sourcebooks, but it does cover all the basics from the first season of the 4Kids cartoon and the write-ups are generally pretty informative (though restricted to bios and lacking any technical data). I imagine the text was taken mostly from the series production bible with additional flourish by Steve Murphy (the credits imply as much). 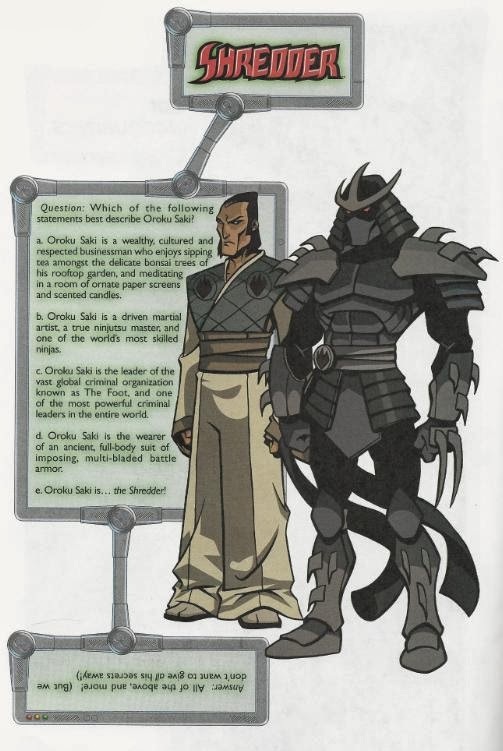 The biographies summarize the basics of the characters, though neglect any sort of in-depth life stories; the show was just getting started, after all (for example, Shredder’s write-up hints that he’s more than he seems, but doesn’t elaborate). On a few occasions, the bios seem at a loss to find anything noteworthy to say about a character. I think the worst is Donatello’s bio, almost a third of which is a generic retelling of the TMNT’s origin while the remainder is an exercise in the different ways one can word “does machines”. Splinter’s write-up also has an unfortunate spelling error, identifying his previous owner as “Hamoto Yoshi”. And because Steve Murphy cannot help himself, he manages to slip some public service announcements into a couple of the entries. Apparently, the Shell Cycle has “anti-pollution exhaust pipes” and the members of the Purple Dragons are only in a gang because they’re too stupid to know that gangs are totally uncool and you should avoid them, kids. There are a few nuggets of characterization present in these write-ups that don’t seem to have found their way into the actual show. Michelangelo’s bio is full of this stuff. Did you know that he’s the most naturally skilled athlete of all the Turtles? His lack of training discipline offsets that talent, however, which is why he only levels out to “average” amongst his brothers. He also apparently loves music and mastered playing the guitar with only three fingers (THAT never showed up in the cartoon). April’s 23, in case you were curious. And apparently, the Mousers were originally intended to be used to rescue people trapped in wrecks or under fallen debris, hence their tunneling powers and prodigious jaws. I guess by the time the cartoon got around, their function was rewritten into being rat-catchers. At only 15 pages (16 if you count the credits page), it was reasonably priced at $2, I suppose. And hey, a sheet of uncut trading cards, if you’re into that stuff. As a sourcebook, it could have been much better, but it’s clear that this book was aimed more at little kids and needed to keep the info uncluttered and brisk. You get to see all the Mirage guys drawing in the 4Kids style with credits as to who did what (I knew Dooney designed the Turtles for that show, but wasn’t aware of Berger’s, Farley’s, Talbot’s and Brizuela’s contributions to the design work), so even I found it somewhat informative and insightful. Grade: I dunno… I don’t really grade sourcebooks. I've always questioned the $2 price tag on the book because I remember my Toy R Us just giving them away. They just had a stack by the exit, past the registers next to the gumball machines in the cart hallway. I honestly think someone didn't know they were for sale and just though they were promotional. Dan Berger told me that he and the other Mirage artists just inked the art. 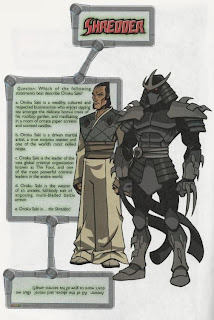 From what I can tell, this sourcebook was released in March 2003. According to Peter Laird's "Planet Racers" blog entry (http://www.planetracers.com/blast/prblast0071.html), it should be released "soon" (written February 28), while according to an entry on IGN (http://www.ign.com/boards/threads/tmnt-day-is-coming-to-toysrus-times-square.35692615/), the sourcebook would be handed out on "TMNT Day" on Toys 'R' Us on Time Square, March 22.